This dish is what I consider to be quintessential Indian and am so happy the very talented Chimnayie (@chinmayiebhat) of love food eat agreed to feature it for my India series. I know the effort that goes into writing a post such as this and I hope you will recognize it too. The craft of this rice cakes or bread making I consider the true sense of old world artisanal. Fermenting and steaming it to a perfect spongy, delicate consistency is a true art form. I even considered making it for Thanksgiving in lieu of corn bread. I found Chimnayie's recent post 'What I grew up eating...' captivating and her Black and White photography is breathtaking. You will also find her site vegan centric. Before you head to the Indian grocer or online to purchase an idli steamer, if you have any type of a steamer at home, check at your local Indian grocer if they sell individual idli bread shallow aluminum/tin/stainless steel plates. Also… street food is a subject close to my heart. Like many other foodies I too believe that some of the best food options are always available on roads. Food is always fresh and has to taste fabulous as it comes with no frills. 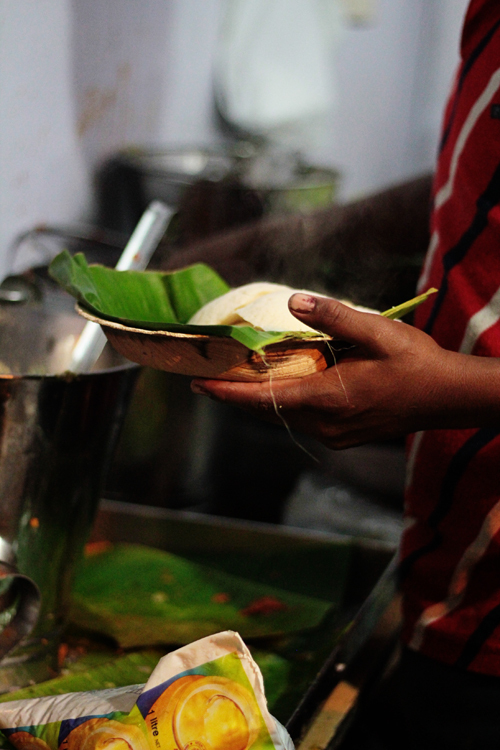 There are several dishes from the streets of Bangalore that I totally adore. I had no clue which one of these to choose for the guest post. After talking/planning about a few of these dishes and exchanging many emails with Shulie, we finally decided on ‘idli’. 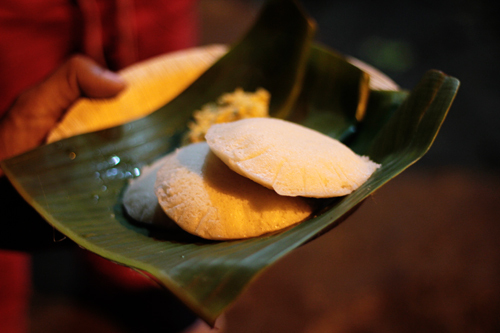 When I think of street food, the first picture I have in my mind is of a plate of hot hot idlies fresh out of the steamer with some spicy coconut chutney and sambar. It’s the most beloved street food of Bangalore without a doubt. People of all age groups love them and enjoy it any time of the day. When I was a student this was my breakfast or lunch many times a week as it’s one of the healthiest street food options and is always inexpensive J They are filling and tasty. Each restaurant has it’s own unique sambar or chutney recipe and I am till date never tired of it. I make it at home for breakfast and then go out in the evening for a quick snack and end up ordering them once again. 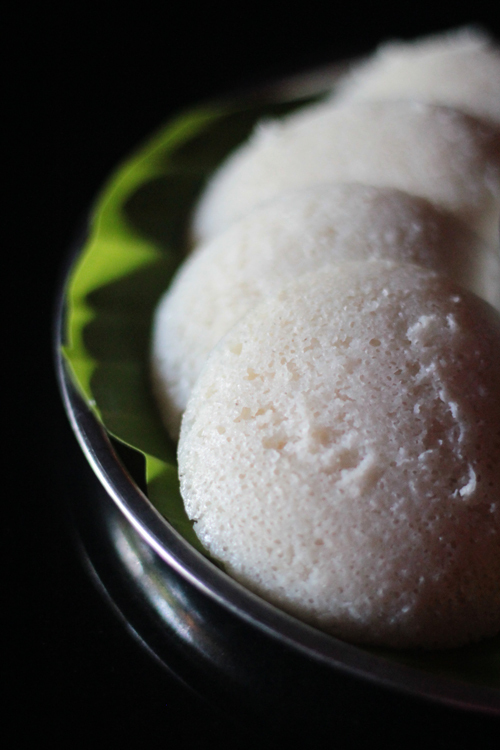 Today I am sharing a basic Idli recipe made from scratch. 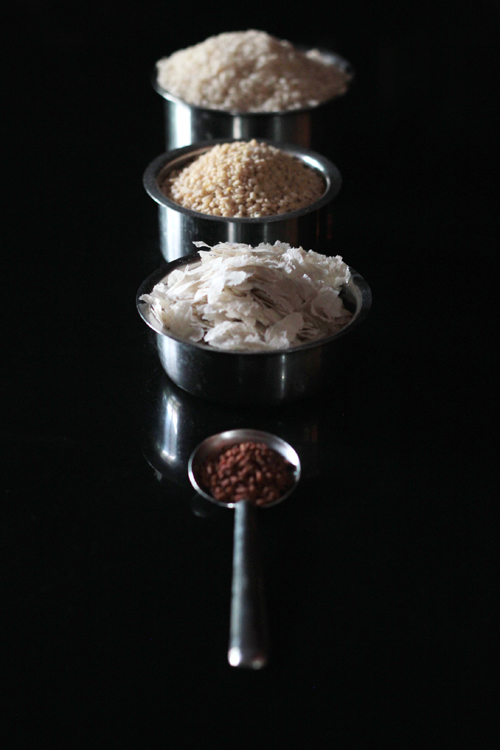 It has very simple humble ingredients and this is how it’s made traditionally in most South Indian homes for generations. Each one of us have our own favorite idli recipe. I like my idlies soft and a little grainy. This is how I make them. I have tried to explain steps in detail and I hope this post can be helpful to you all. 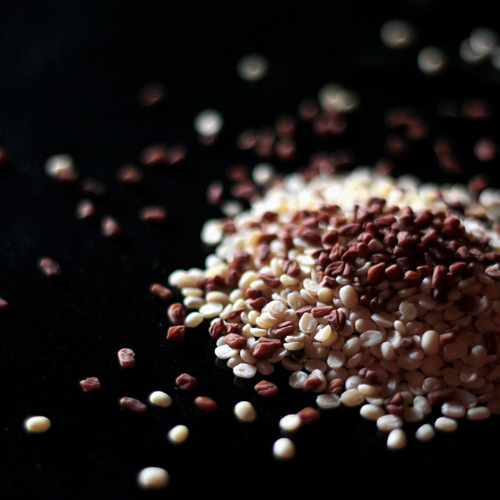 Wash well and Soak the rice and black gram with fenugreek seeds separately for at least 6-8 hours with just enough water to submerge them. Drain both and reserve both the water separately. Grind the black gram with fenugreek seeds into a silky smooth batter with the water that it was soaked in. Using a wet grinder would be ideal but I use my regular blender and idlies come out just fine. Grind it till it’s done and then grind it some more. Do not make it watery, use just enough water to grind. Making this extra smooth is the secret behind soft idlies. Watch out for small bubbles that appear while grinding, it means the batter is now ready. Keep this aside in a deep vessel. Now grind the rice with the water reserved from soaking the black gram (if needed with the water rice was soaked in) till it’s almost done but still a little grainy. 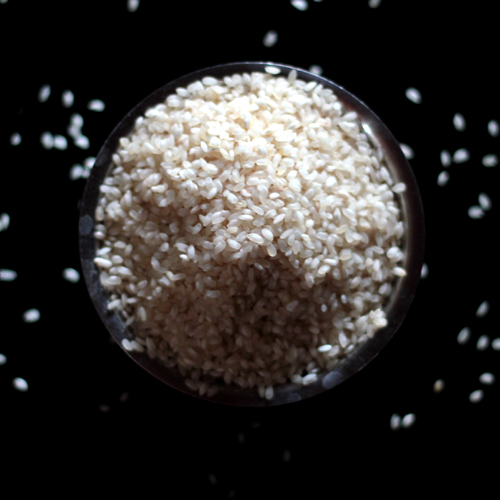 When it’s almost ready add the cooked rice or if using flattened rice, let it soak in water for 5-10 minutes. Grind it for 2 more minutes. At this stage if you want your idlies very soft without any grains continue to grind the rice till the batter is smooth. Combine both the batters and mix well. Use your hands for the best results. Your body heat will help it get fermented better. Make sure there is enough room for the batter to double in the vessel. Once combined well, close the vessel with a lid (not air-tight) and place it in the warmest place in your house, let it ferment over night. You can cover the vessel with a thick blanket if the weather is not warm enough. Next morning the batter should have doubled. Add salt and mix the batter well. Pour it into slightly greased moulds and steam for 10 – 15 minutes. Idlies get cooked really fast so make sure not to overcook them. 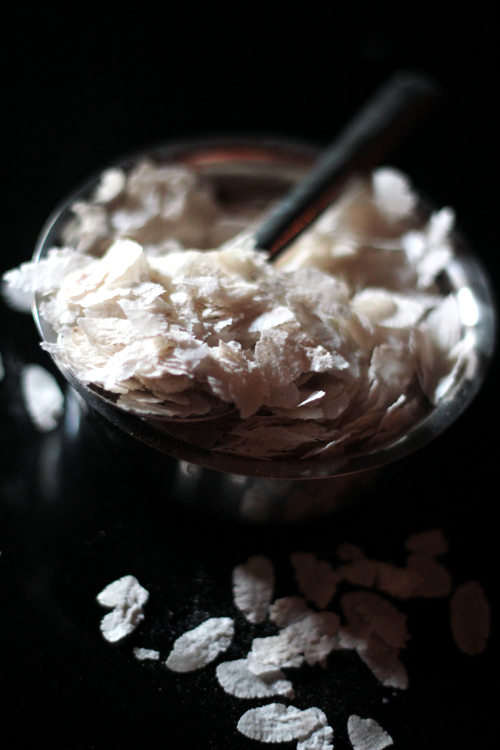 get them out of their moulds and Serve them with piping hot sambar or fresh coconut chutney. What awesome photos and a great recipe. We have something similar in the Philippines...it's called "putong puti", a white rice cake. The process is almost similar, steaming it & it's so delish! Thanks for sharing.I'll show this to my son, he loves Indian bread! Great addition to the street food series! I love idli and it get made at home once every two weeks! An absolute treat with the chutney and sambhar. Love that first photo with the wisps of steam! A lovely guest post! That speciality is intriguing and so is the ustensil to steam the idlis. Thanks for sharing. Perfect! One of favourite breakfast and comfort foods. What a great insight into Indian food culture, thanks so much for sharing. These look amazing and so delicate! The recipe is perfect ---- healthy and yummy. Glad people are enjoying the post and photos... Thank you all! asian cultures have steamed rice cakes too! i love making them, but so laborious! those rice cake molds are so unique! TY Betty An for sharing the Filipino version. Junia, yep true very laborious but so worth it. We also make steamed cakes with lentils and my mom's version with semolina. TY Shruti for the wet grinder tip and holding my hand on twitter. :) TY An, ain't it?! A treat?! :) Thx Sylvie, indeed Chinmayie is a very talented photographer. Thx Rosa, the equipment is absolutely gorgeous. There are many versions. Mine has individual plates. TY Shri, we ate it for b-fast, lunch and with dinner too:). My version has a sweetness to it but cannot wait to try Chinmayie's rice one! :) TY Nelly and Brian, that is exactly why we decided eventually on idlis though they aren't simple to make. We felt the deserve the attention:). Aww Chinmayie, I adore you and the work you do. TY for being such a wonderful guest! @notyet100 you welcome. Let us know once you do. I wish I could taste this right now! i came to your blog, from chinmayie's blog... chinmayie photos are stunning, but i must also say that your photographs are also stunning. 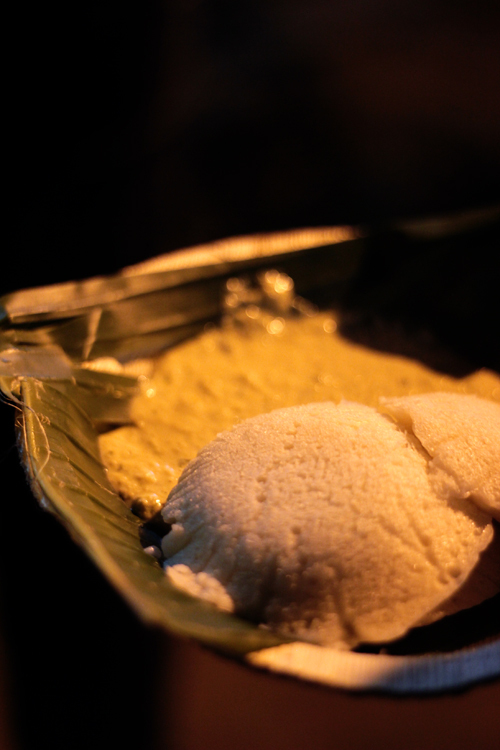 Beautiful photos - I've never tried idli - they look very delicate. I do love street food - thank you for the detailed instructions. Your pictures are just gorgeous! Thank you for sharing this with us! BA is right on with "Putong Puti"! I may have to make some today. I'm getting very hungry reading blogs ;-). amazing pictures chinmayie and a great post! 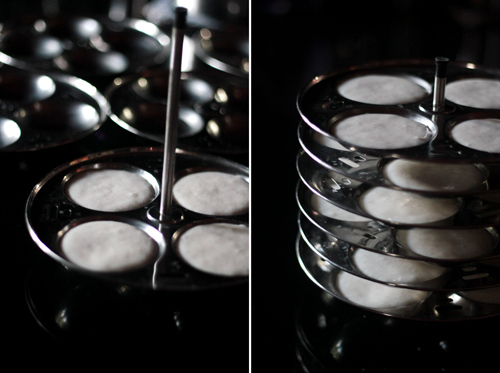 love the beautiful white steaming idlis.. we've been making multi lentil idlis lately to amp up the nutrition! One of my favorites and I am craving some since yesterday ... Chinmayie the photographs are just to die for. 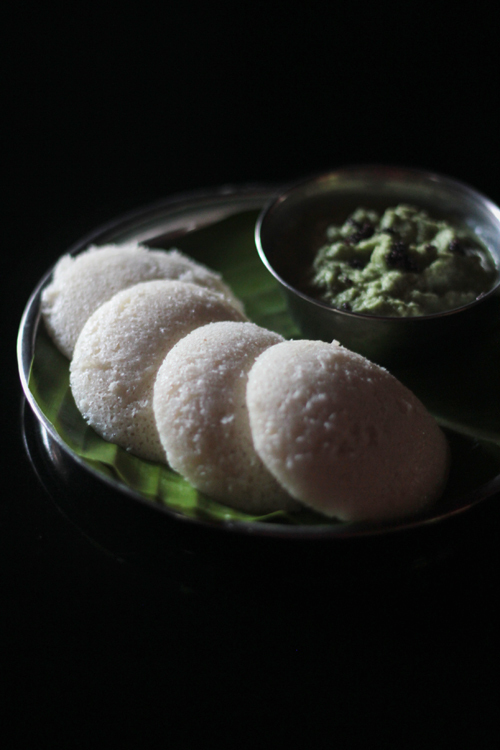 You have captured the true essence of the fulfilling steaming hot idlis as well as it as a street food! Beautifully done! Kudos to you. What a wonderful guest post! These photos are beyond unreal! Wow. Gorgeous. 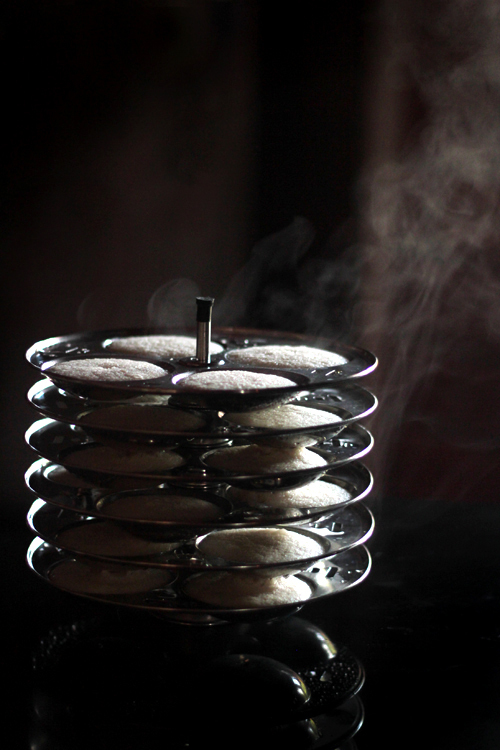 I love idli and have never ever tried to make them - maybe it's time to invest in an idli steamer? 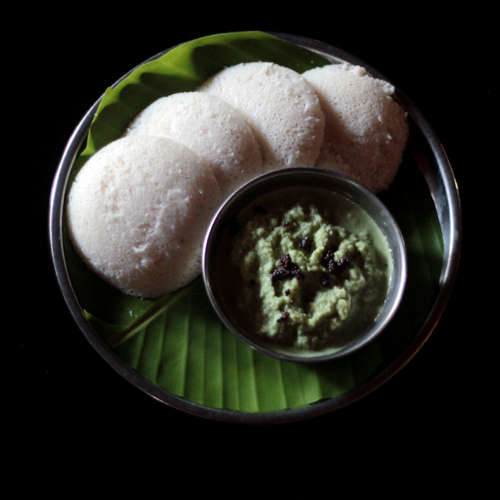 I didn't know idli at all but now I would love to try it. It looks rather intriguing and lovely...so delicate. Beautiful photos, too.